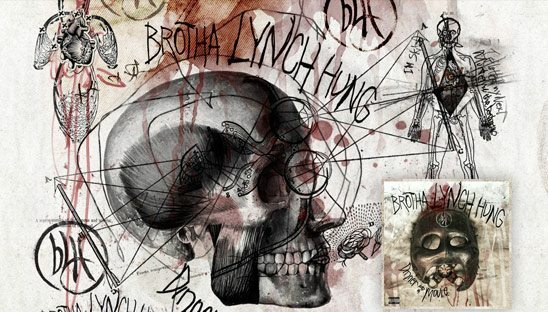 Brotha Lynch Hung watches a lot of movies, mostly horror flicks. The King of Sacramento also writes screenplays: While penning his first script, he simultaneously wrote his Strange Music debut, Dinner and a Movie. Blurring the line between audio CD and audio book, listeners are sucked into the highly imaginative mind of Lynch as he plays out gruesome tales of murder, violence and deception. Powered by his twisted sense of humor, Dinner and a Movie is both therapeutic and fantastical, as Lynch unleashes his own demons while at the same time creating a character so unlike himself. This is our 6th time designing a myspace and twitter page for Strange Music. As always, they supplied us with some amazing CD artwork and we did our thing with it.